Investigating L1 transfer is one of the basic principles of foreign language teaching. What else can German speaking pupils make of all the English grammar rules and vocabulary if they do not compare it with their mother tongue in order to understand the foreign language better? How can teachers understand their pupils' language errors? Where do the errors come from? Can we track them? What influence do errors and English-German contrastive analyses have on acquiring a second language and the method of teaching? Errors are systematically made by learners most of the time. Teachers can improve their pupils' weaknesses if they understand the processes that lie behind the errors. My line of arguments in the field of second/foreign language learning will show those processes. 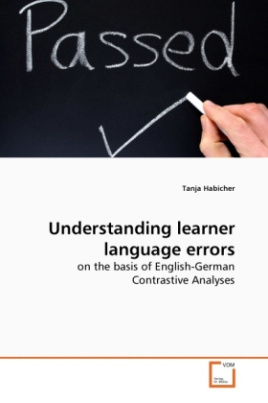 Furthermore, this book also focuses on the great number of influences every pupil has to deal with and emphasise the necessity of understanding errors, especially on the basis of English-German contrastive analyses as a language teacher.